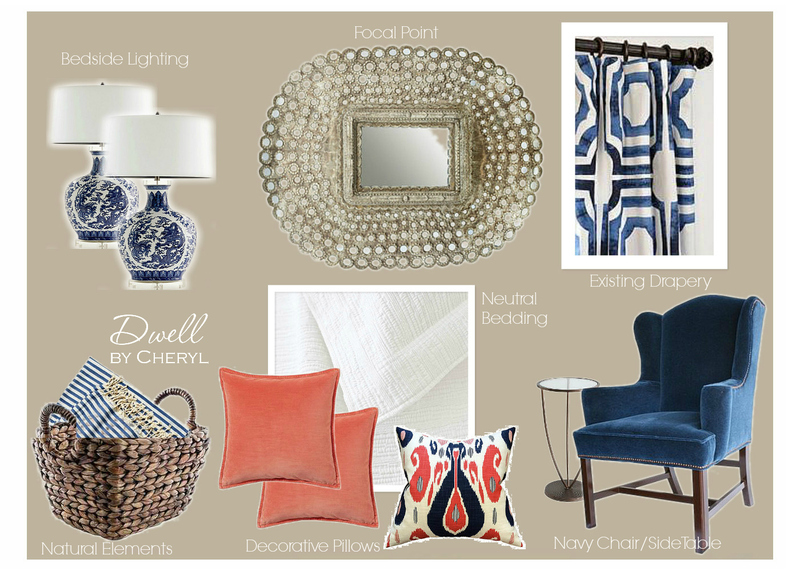 Dwell by Cheryl: "Coastal One Day Design Plus Reveal"
I'm back! I've been M.I.A. for a while, but it was for good reason. Last Wednesday I celebrated my 40th birthday and spent the week on vacation, speaking at the Black Southern Belle event (more about that soon) and taking a little girl's getaway to celebrate with family and friends. 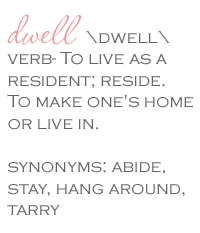 Today, I'm back at it and excited to share with you my latest project. 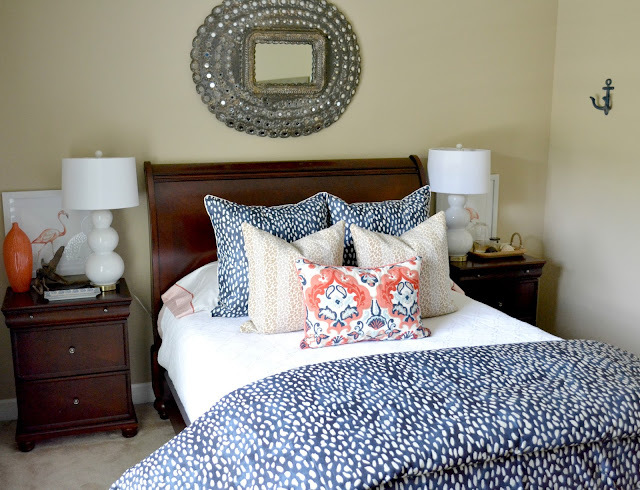 Recently I shared that I was working on a One Day Design Plus project for a family who needed to spruce up their guest bedroom fairly quickly, well we completed the project last weekend and I think it turned out great! We began by pulling together a quick idea board utilizing some of the homeowner's existing items. While the client had a number of foundational pieces (i.e. 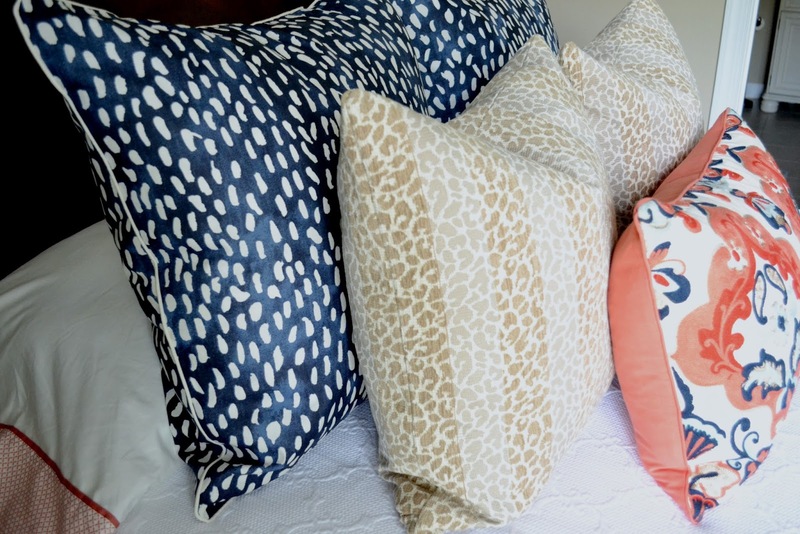 pillows, duvet, furnishings), essentially began with a blank slate. We utilized the existing drapery to build out a blue and coral scheme with a bit of a coastal flare. 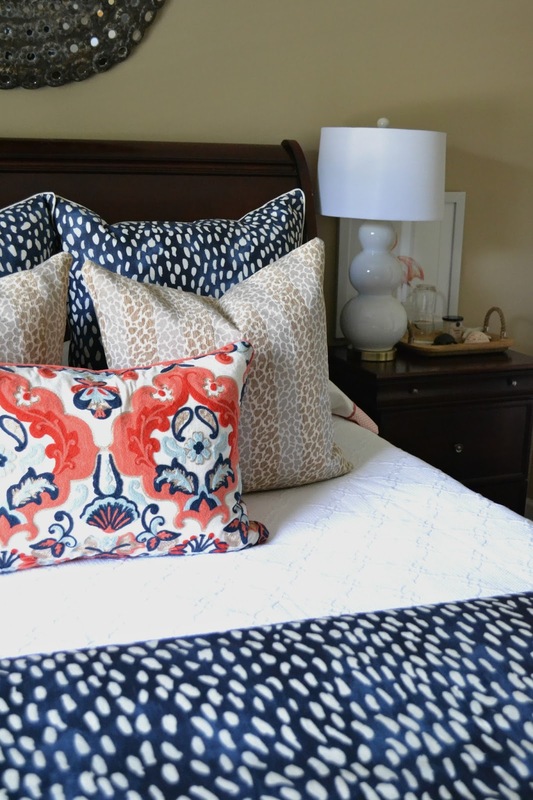 As usual, pattern mixing played a huge part in pulling the color scheme together. The client requested a fresher and more modern looked to balance the traditional look of the furniture and the existing wall color. We chose to begin with a simple what matelassé bedspread and build from there. 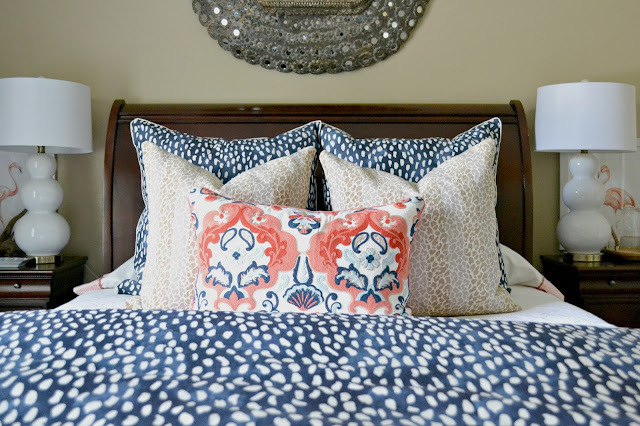 This navy organic dot duvet cover and sham set struck the perfect note with the geometric drapery. As I've been known to do, I added a touch of animal with custom taupe and white animal print pillows. The coral and blue crewl pillow is likely my favorite thing in the entire space. This gallery wall was just what this room needed to add a bit of personality and to mask the television. Adding in a bit of variety with the turtle shed and the paddle keeps it interesting and adds visual interest and texture. 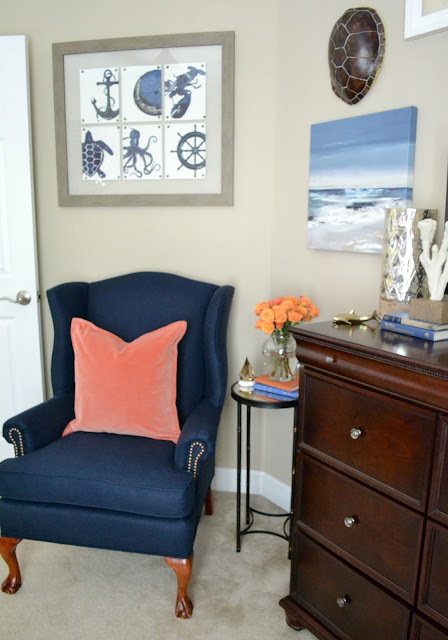 The client's existing chair was given a makeover with navy blue linen and antique brass nails. 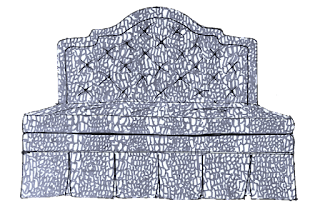 Baity's Custom Upholstery never ceases to amaze with what he can do with a piece of furniture. You'll notice that the blue and white lamps didn't make the cut. It turned out to be just a bit too much pattern, so I went with this classic white gourd lamp instead. 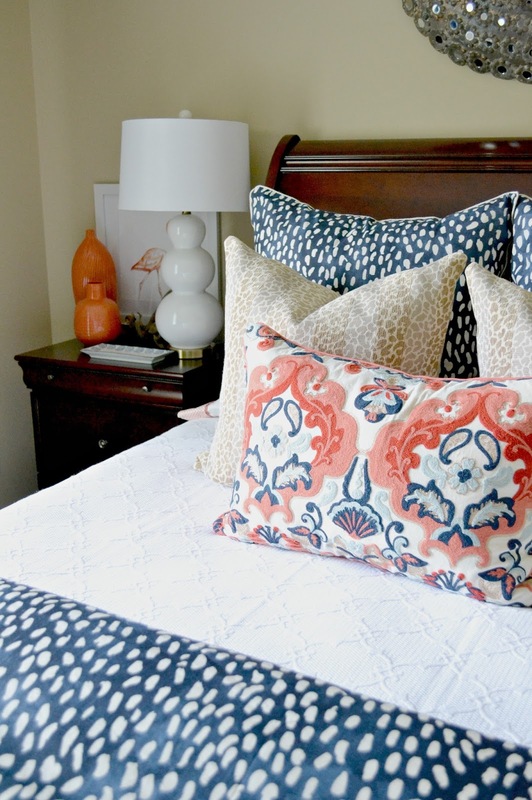 And, how cute is that flamingo print? We scored a pair and used both in bedside vignettes. I love how it all turned out, and can hardly believe that the project was just one month, start to finish. Mission accomplished! Beautiful! 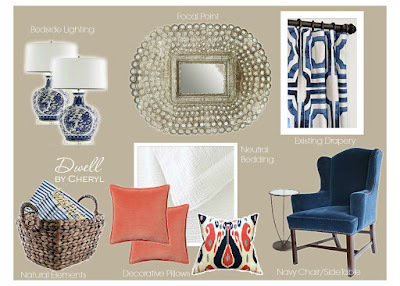 I love a good pattern mix and the navy chair looks so sharp, dressing up that side of the room. Beautiful space! Love the bedding combo.